7 no cook lunch box recipes that you can prep in under 30 minutes! These adult lunch box ideas are perfect for meal prep. There is this notion that meal prep has to involve cooking…that is not necessarily true. 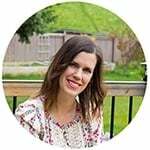 I mention in my How To Meal Prep post that one way to meal prep is simply to portion out your ingredients, and that’s just what these meal prep lunch box recipes entail today! 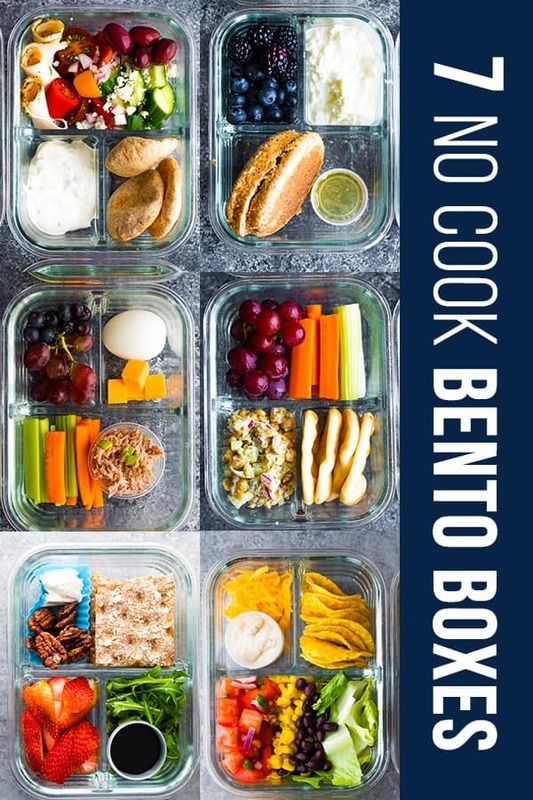 Not only do these bento lunch box recipes require little to no cooking, but they are assembled in under 30 minutes…some in only 15. That is perfect for summer when we’d rather be having fun in the sun than stuck in the kitchen. 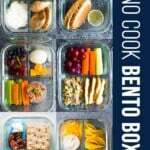 For most of these bento box recipes, I picked 1-2 items from each category and assembled the boxes. Certain ingredients will keep better than others. 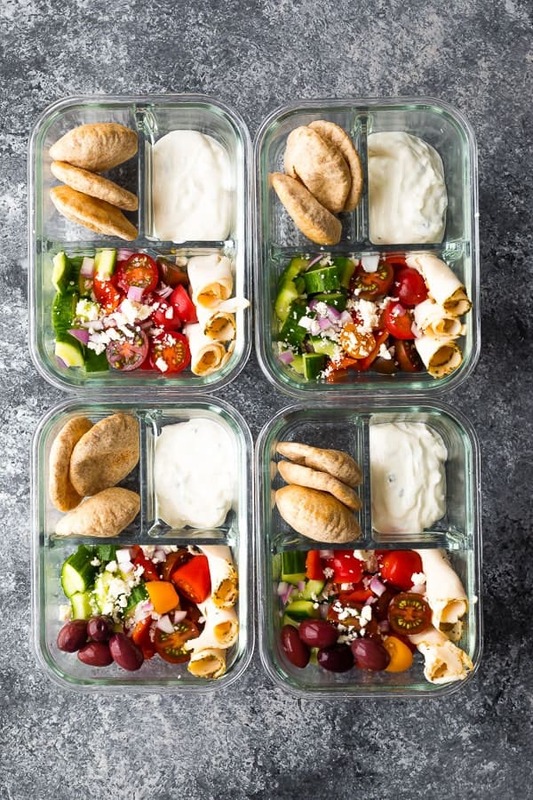 With Greek salad, deli chicken, pita bread and tzatziki, this box lunch recipe is healthy, super simple to prep, and packed with delicious Greek flavor! While technically this is a ‘breakfast box’, this recipe makes for a delicious lunch as well! Fresh berries and cottage cheese are served on an English Muffin and drizzled with honey. get the printable English muffin bento box recipe here! 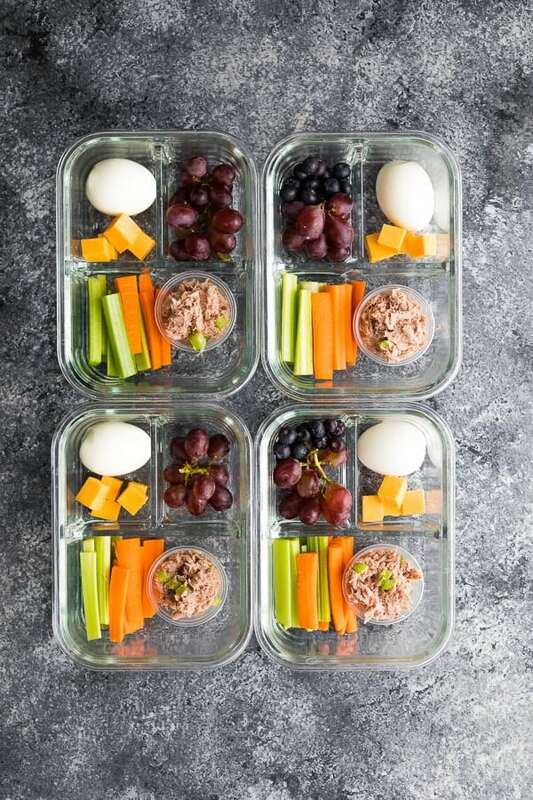 Like the popular Starbucks protein box, this tuna protein box is packed with protein, thanks to tuna, a hardboiled egg (the only thing you’ll have to ‘cook’ in all of these recipes) and cheese. 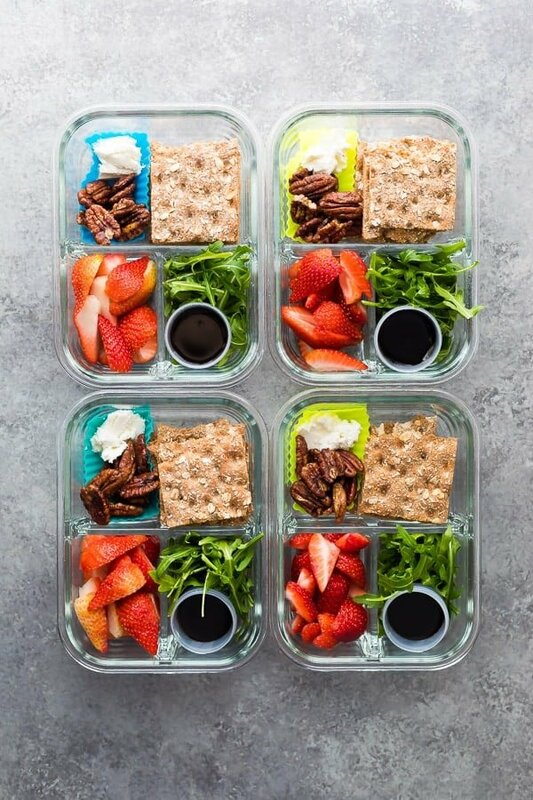 Swap the grapes and blueberries for strawberries or more veggies and you can make this a low carb/keto box lunch! find the printable tuna protein box recipe here! This chickpea salad lunch box is a delicious, protein-packed vegan box lunch (if you use vegenaise). Served with mini naan bread, veggies, and grapes. get the full Chickpea Salad Lunch Box recipe here! I like to think of these spring strawberry bento lunch boxes as fancy crackers and cheese. With candied pecans, goat cheese, strawberries, arugula and balsamic reduction, all served on top of a flatbread cracker. get the full Spring Strawberry Bento Lunch Boxes recipe here! Tons of fresh veggies in this one: crunchy romaine (which keeps surprisingly well in meal prep recipes! ), black beans, corn, and a quick pico de gallo. Tortilla chips, shredded cheese and creamy avocado dressing round out this recipe. 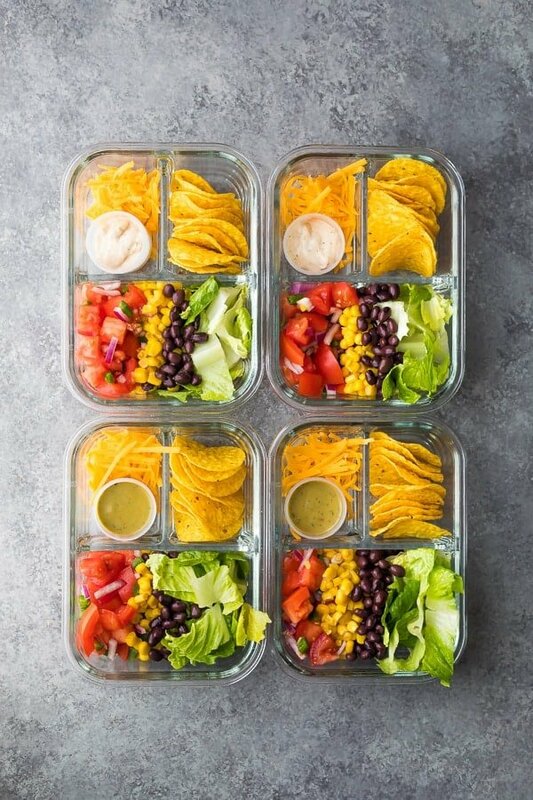 get the full taco salad bento lunch boxes recipe here! 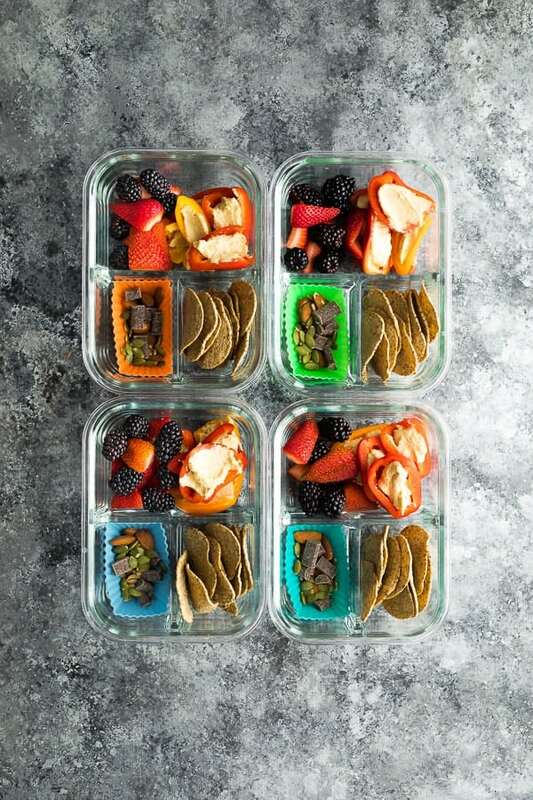 With hummus-stuffed mini peppers, fresh berries, trail mix and black bean tortilla chips, this vegan bento box definitely keeps lunch interesting! get the full vegan bento lunch box recipe here! 1/2 cup dressing of choice cilantro lime dressing highly recommended, see notes! Stir together all greek salad ingredients. 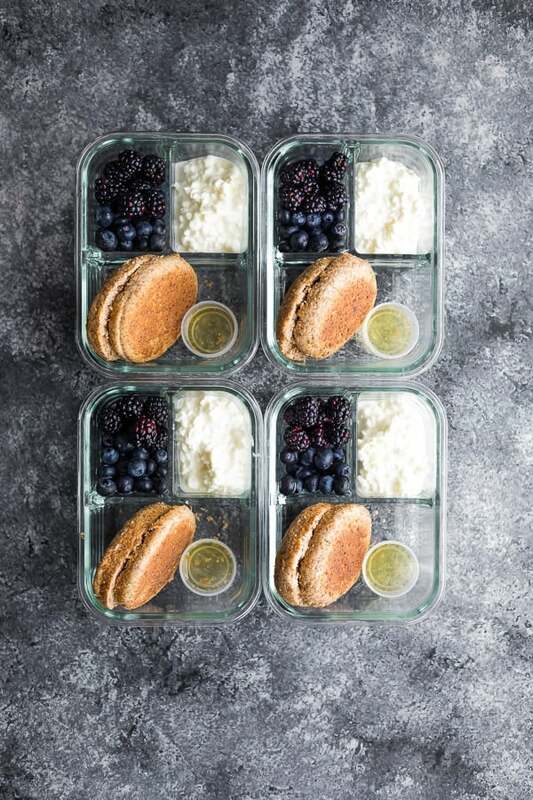 Divide between four bento lunch boxes. Divide all remaining ingredients between bento lunch boxes. To serve, top the english muffin with cottage cheese and berries. Drizzle with honey. Cook and cool hard boiled eggs (I used my Instant Pot). You can leave them with the shells on or peel them after they've cooled completely. Stir together tuna salad ingredients and divide between containers. Divide all other ingredients between containers. In a medium bowl, mash the chickpeas with a spatula or potato masher. Stir in the mayonnaise/vegan mayonnaise, dill, salt, pepper, celery and red onion until completely combined. Divide between 4 bento-style lunch containers. Divide up the grapes, vegetables, and flatbread between the containers. Stuff the mini bell peppers with hummus. Mix together the trail mix. Divide all ingredients between four 3-compartment storage containers. Finding your website was such a joy. I’ve been looking for ways to upgrade my lunches from containers to ingredients. I enjoy making lunches with all the new ideas. Wow, thank you so much, Rick! Thanks so much for your kind words. Happy Monday! 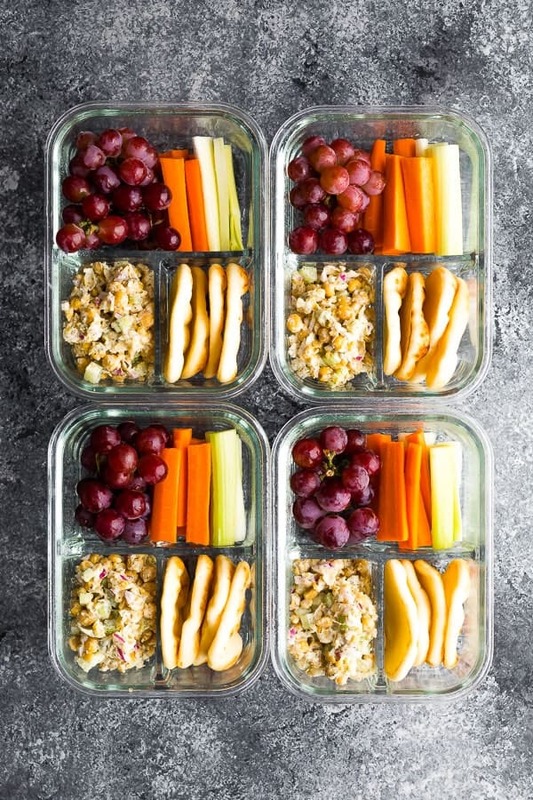 What a terrific collection of yummy lunch ideas here 🙂 Thank you for the shout out about my EasyLunchboxes containers!